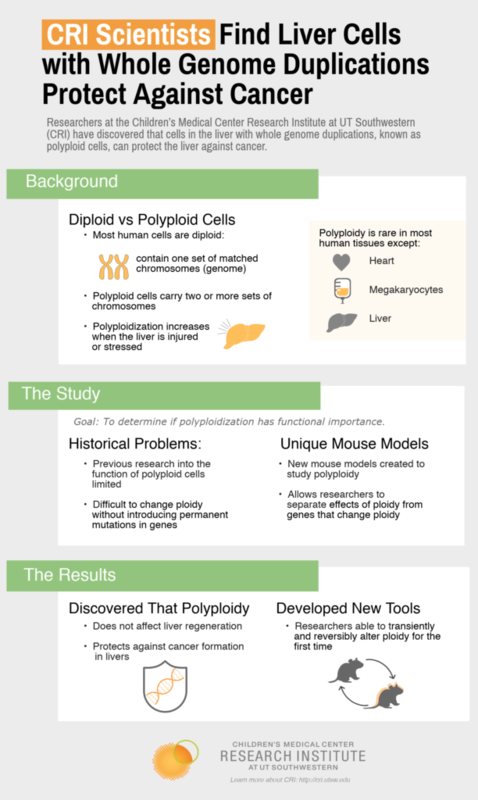 Study shows polyploid cells protect against liver cancer. DALLAS – February 8, 2018 – Researchers at the Children’s Medical Center Research Institute (CRI) at UT Southwestern have discovered that cells in the liver with whole genome duplications, known as polyploid cells, can protect the liver against cancer. The study, published online today in Developmental Cell, addresses a long-standing mystery in liver biology and could stimulate new ideas to prevent cancer. Co-authors from UT Southwestern Medical Center included Shuyuan Zhang, graduate student at CRI; Dr. Kejin Zhou, Instructor at the Harold C. Simmons Comprehensive Cancer Center; Dr. Xin Luo, Data Scientist at CRI and in Bioinformatics; Lin Li, Senior Research Scientist at CRI; Dr. Liem Nguyen, former graduate student at CRI; Yu Zhang, Senior Research Associate at CRI; Dr. Purva Gopal, Assistant Professor of Pathology; Dr. Branden Tarlow, Internal Medicine resident; and Dr. Daniel Siegwart, Assistant Professor at the Simmons Cancer Center and of Biochemistry. Dr. Ho-Chou Tu, scientist, and Dr. Alfica Sehgal, Associate Director, both of Alnylam Pharmaceuticals, also contributed to the research.